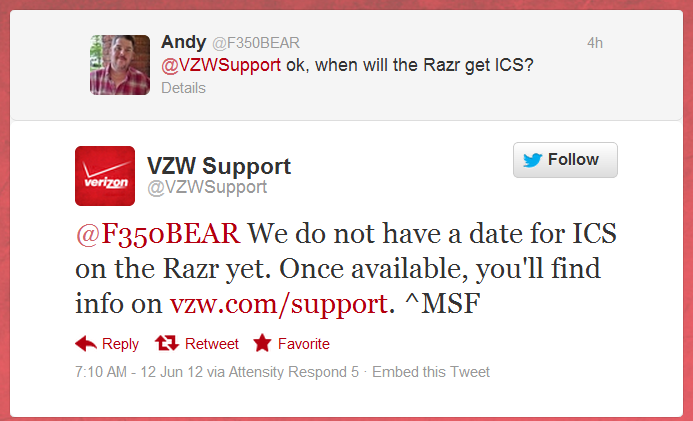 Last week, CNET reported that the DROID RAZR would receive Ice Cream Sandwich on June 12. Clearly that is not happening. In a tweet from VZW’s support Twitter page, they mention that a date has not been given for the update, which leaves us with basically no concrete idea as to when we can expect it besides the previous “before the end of Q2” report. Like most other updates from Moto and VZW, we can expect Moto Feedback Network users to receive emails about a possible soak test before the update is officially ready, so until we see those, we’ll have to remain patient.